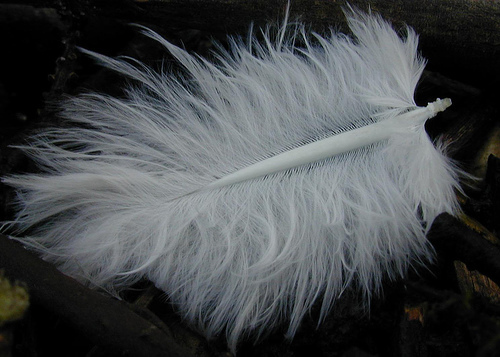 When I began my walk at the high school track this morning, I noticed that a white feather was right in front of me. I watched as the wind carried it along. It touched the ground occasionally but then floated back up into the air. I realized that that is how my heart feels these days. Not because there are no trials in my life, but because I have rediscovered the rich treasure of the gospel. This is in large part due to Tullian Tchividjian’s book Jesus + Nothing = Everything. Tullian was our pastor when we lived in south Florida and I have never met a more gospel-intoxicated man. He truly understands God’s grace and takes great joy in sharing that precious gift with others. This book was birthed out of a devastating season in Tullian’s life and as he sought God as never before, he realized in a fresh and life-altering way that “the gospel is way more radical, offensive, liberating, shocking, and counterintuitive than any of us realize…like Aslan in C.S. Lewis’s Chronicles of Narnia, the gospel is good but not safe.” (p.11). In so many ways, we accept that the Gospel saves us and we thank Jesus for doing what we could never do for ourselves: bring us into a loving relationship with a holy God by taking our sin upon Himself. It is all so unnecessary. We really can live free. The truth is, we were never meant to go beyond the gospel. For the rest of our lives and on into eternity, we are destined to go deeper into its wonders, majesty, and breathtaking beauty. Understanding the height and depth and breadth of what Jesus did for us on the cross is the only thing that will set our burdened hearts forever free. We desperately need a change of focus. It is NOT about what we do. It is ALL about Jesus and what He has already done. We do not add anything to His finished work on the cross. When we truly grasp this, we are “strangely liberated by fresh realization of our own smallness.” (p. 64). I never realized what a heavy load I was carrying, always striving to be good enough, to earn the grace that is freely given, to feel as if a godly life was at least partially up to me to get it right. No wonder I felt like I was running on a treadmill: faster and faster but with nothing to show for it except stagnation. It is priceless to know without a shadow of a doubt that “because of Christ’s finished work, Christians already possess the approval, the love, the security, the freedom, the meaning, the cleansing, the forgiveness, the righteousness, and the rescue we intensely long for, and in fact, look for in a thousand things smaller than Jesus every day—things transient, things incapable of delivering the goods. The gospel is the only thing big enough to satisfy our deepest, eternal longings—both now and forever. ” (p. 77). Every single thing I need, I already have in Christ. For the Christian, there is no such thing as lack. There is only what we perceive as lack. Christ fills all. (Ephesians 1:23). How can we honestly think that we are missing anything? This truth has so liberated me! I no longer have to strive, to grasp, to cling, to be frustrated by what I don’t have but think I need. When He says no to something that I would like, I rest in the knowledge that He is enough. I accept it and move on with my day, knowing that He is in full control and He has already given me everything I need. “God is always good and I am always loved.” (Ann Voskamp). “The banner under which Christians live reads, “It is finished.” So relax and rejoice. Jesus plus nothing equals everything; everything minus Jesus equals nothing. I grasp the freedom of this truth only ever so often—much like that feather floating along, but only occasionally touching the ground. My hard head can’t seem to get it and hold on to it! You can also search the message library to watch the Jesus + Nothing = Everything sermon series. They are fantastic! Powerful words, Susan. Now to live them fully, without a shred of doubt and furious striving. I’m afraid I’ve been beating up on myself lately, trying hard to do more, be more, give more, gain more. Christ is enough; I rest in the thought tonight. Thank you for weighing in at the blog today; I’m glad to visit with you tonight.